Cabbage Savoy Perfection Brassica Oleracea is an open pollinated cabbage that has solid, round heads. Cabbage Savoy Perfection seeds can be started indoors 6 weeks before the last frost and transplanted 3-4 weeks before the last frost. The plants should be spaced 10-20 inches apart. Cabbage Savoy Perfection can be planted for late summer or fall harvests. For a late harvest Brassica Oleracea seeds have to be planted directly outdoors in mid spring. Cabbage Savoy Perfection has a mild flavor that makes it superb for making coleslaw, sauerkraut, or it can be steamed and stir-fried. 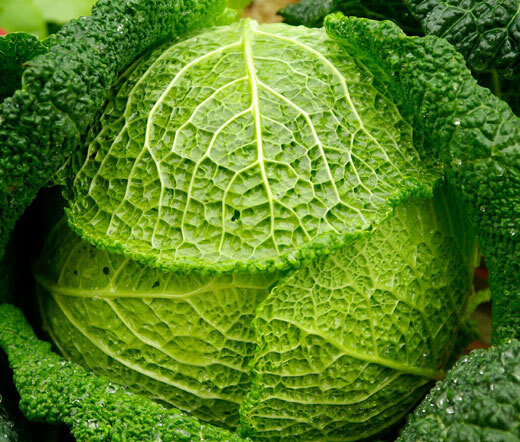 Cabbage Savoy is at its best after a frost, and its dark-blue, green finely curled leaves make good wrappers.